In previous post, we learned the difference between get() and load() methods in Hibernate. In this, we can discuss difference between the save() and persist() methods of Hibernate. This is one of the famous Hibernate interview question. 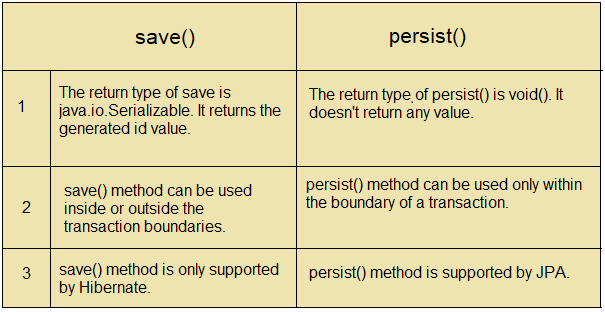 The save() method which takes a transient object as input and put it to its persistent state. This method returns a generated identifier. int id = (Integer) session.save(emp);   //save is called which will add this transient object to persistent state. In the same way persist() is another method to store objects in database i.e. changing transient objects to its persistent state. But persist() method does not return anything. session.persist(emp);          //persist is called which will add this transient object to persistent state. 1) What is the difference between get() and load() methods in Hibernate? 5) What are different states of an entity bean in Hibernate?